Two types of Spanish Ham. Which are the main differences between the Serrano ham and the Iberico ham? Iberico ham is not the same as Serrano ham, as Iberico ham quality and production processes are much different so there is a logical difference. Iberico ham is made of pigs which roam freely and they fed only in acorn and herbs. We may feel Iberico ham is an expensive product if we compare it to Serrano ham, Parma ham or Bayonne ham but that would equal to compare pears to apples as the flavour, taste, smell and properties of Iberico ham are very different regarding any other ham, we can say they are unique. Iberico ham consumers know they are buying an exceptional product made of free roaming pigs living in the dehesa (a kind of Mediterranean brushwood), they feed only on natural products (herbs and acorns) and its curing process lasts from 8 months to 36 months. Iberico ham meat can be from purple red to light pink and its sweet, lasting and slightly salty flavour turn the palate into an explosion of delicate flavours. Moreover Iberico ham possesses a high degree of oleic acid which is beneficial to combat cardiovascular diseases and unsaturated fats that do not increase cholesterol levels. Iberico ham: Feeding and free roaming are keys. Iberico ham is made of Iberian pigs a unique breed in the world. This pig breed is raised in Spain in the southwest dehesas. 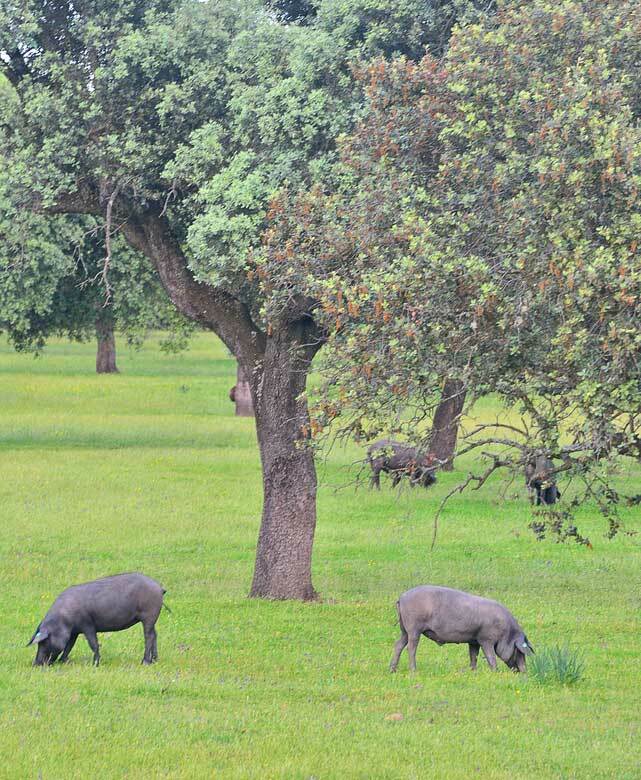 Iberian pigs live and roam freely in a sole ecosystem known as “Dehesa” a brushwood of holm oaks and cork oaks. They feed on grass, acorns and herbs. This raising process is expensive as three Iberian pigs need two dehesa hectares of grass and acorns to live and develop. At the “montanera” time (when acorns fall from holm oaks), the Iberian pig will forage for acorns and it will double its bodyweight. The oils that acorns contain will penetrate into the Iberian pig muscles. This will give its unique taste to the Iberico ham and also the hazelnut scent. Roaming freely in the brushwood makes the Iberian pig crossing big distances everyday to find acorns, all this movement means Iberian pigs muscles are leaner and the fat of the acorn penetrated deeper into their muscles making their meat juicier and with an exceptional flavour. In the fattening phase, an Iberian pig can eat up to 12 kilograms of acorn a day, acorn is a fruit from holm oaks rich in monounsaturated and polyunsaturated fats, its carbohydrates give the Iberian pig meat its unique taste and smell and offer clear benefits for your heart. The reason is acorns provide essential oils whose fragrance assimilate to the meat of the Iberian pig. Serrano ham, Parma ham among other are made of regular (pink) pigs, these pigs do not roam freely they are raised intensively in farms, they are fed on fodder and they do not make any physical exercise in order to fatten them as soon as possible which takes a toll on the flavour of their meat. There is no sense trying to compare Iberico ham with any other ham like Serrano ham, prosciutto de Parma or similar cured hams. Iberian pigs possess a genetic peculiarity which allows them to form their fat in a very different way than other pig breeds, giving them unique characteristics in taste and smell. The main organoleptic characteristics when enjoying Iberico ham are: colour, smell, flavour and texture. Advice on how to distinguish an Iberico ham from Serrano ham. Regarding flavor one of the biggest differences is Iberico ham is juicier than Serrano ham, the Iberico ham fat stimulates the taste buds. Iberico hams possess fat strips which are milky white, soft, shiny even fluid if you touch this grease your fingers will be covered in this fat and feel a soft touch and the colour of this grease is ivory. On the other side Serrano ham fat is hard and white with some yellowish tone. The cause is due to the unsaturated fat of the Iberian ham different from Serrano ham fat and other regular hams made of pink pork. Scent is another quality that makes Iberico ham a unique product as its smell is much more intense and fragrant than any other ham such as Serrano. Iberico ham colour can be red purple to claret red. It has a marble texture with fat interspersed. Serrano ham colour is pink and no marbling is found as there are no layers of fat interspersed with meat. 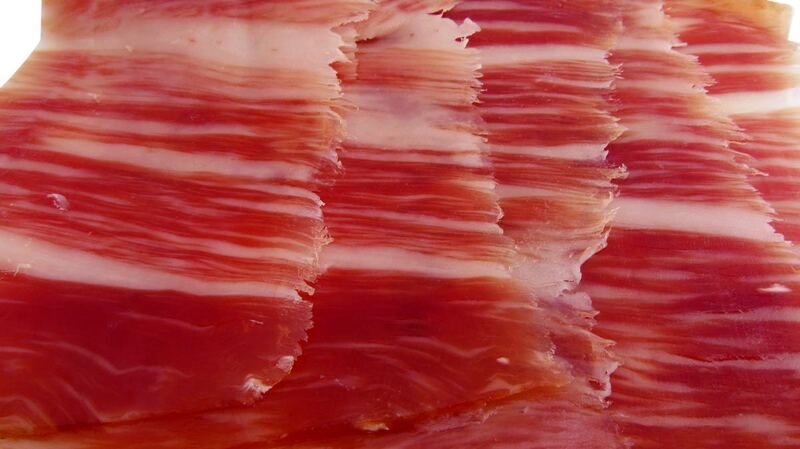 These layers of fat make the Iberico ham literally melt in your mouth when you eat it. Iberico ham has a lower level of salt compared to Serrano ham, which magnifies its flavour and aroma. 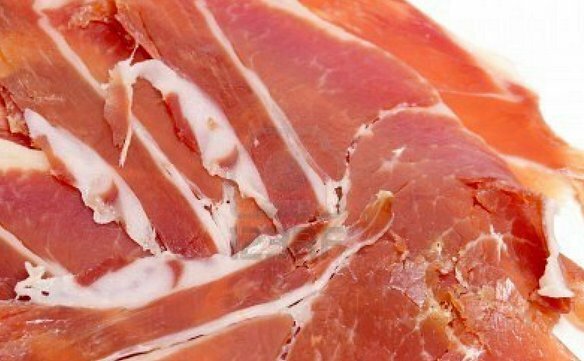 Serrano ham has less content of high quality proteins and a bigger amount of salt which makes it not suitable for high blood pressure patients. Iberico ham quality can be measured on how good has been its feeding (herbs, cereal, acorns and chestnuts) specially how many kilograms of acorn, how active the pork has been and the curing time of the ham. Due to the acorn feeding and the free roaming of the Iberian pig, the acorn Iberico ham is the highest quality you have ever tried. It is more expensive because the curing time is longer, the feeding is better and more natural. Anybody who tries Iberico ham, can testify about its quality. Acorn Iberico ham is an exquisite and unique product and cannot be compared to any other hams. There is no ham like Acorn Iberico ham or Pata Negra (black paw). Jamonify only offers the best acorn Iberico ham cured from 36 to 42 months. We invite you to treat yourself to the best Spanish delicatessen, the most exquisite jewel between Spanish acorn Iberico ham producers: juicy, tender and delicious Spanish acorn Iberico ham slices hand cut by our skilful artisans.